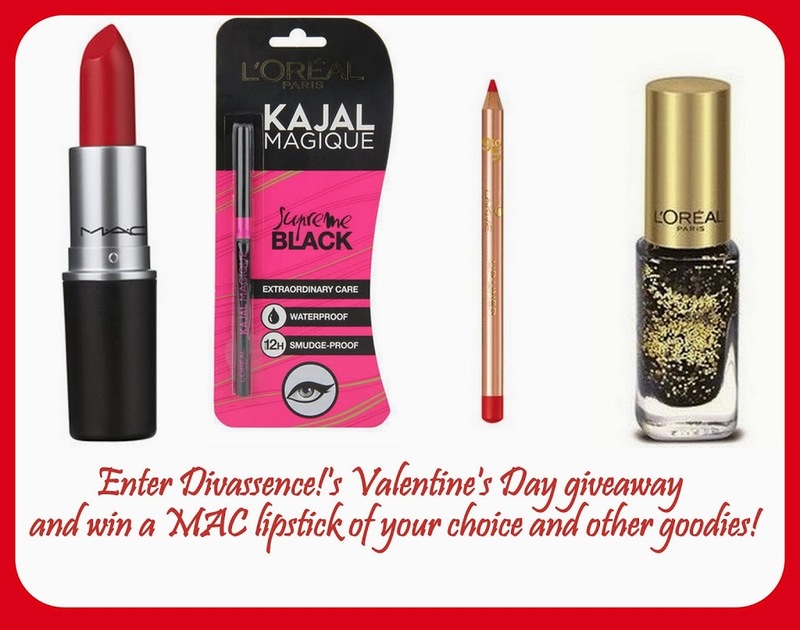 Divassence's Valentine's Day Giveaway: Enter and win a MAC lipstick of your choice and other goodies! - Divassence! Hello!!TGIF! I was looking forward to this particular Friday for a good reason (for me and you!). It’s time.. for a giveaway! Woohoo! What is the giveaway about? 1st prize: A MAC lipstick of the winner’s choice from the permanent collection. 2nd prize: L’oreal Kajal Magique, L’oreal Color Riche Vernis 824 L’Or Nailpolish, Lakme 9 to 5 Lip liner in Red Alert. All the mandatory entries must be completed for your giveaway entry to be valid. The giveaway is open only to the residents of India. If you live outside India and have a valid Indian postal address, you can enter the giveaway. All products are brand new and the prizes are bought with my own money and is not sponsored. Once the prizes are shipped, Divassence! or I (Deepika) will not be responsible for loss/damage in transit. The giveaway starts on the 10th of January 2014 and ends on the 13th of February 2014, 23:59 PM. Entries after this particular period will not be considered valid. The winners will be announced on 14th February 2014. It is also sad to see that people immediately unfollow/unsubscribe once the giveaway is over. We will be keeping a track of the names of those who enter the giveaway and if such a thing happens, you will be banned from future giveaways. Winners will be contacted by mail and will have 48 hours to respond. Special Plans for Valentine’s Day..
Did Al d Steps Sweety :). No special plans for Vday as of now.. but may be V day special look.. errghh wat else cud be expected from beuaty bloggres.. 😛 :P..!! Some issue with the tweet link.. u might want to check.. it’s exceeing max limit!! I’m so excited for v day bcs itz its my first v day as couple *so happy* . As I love me the most, it will be a day of Spa and pampering the self on V-day. I have no date this valentine so i’ll be on a shopping spree..!! Its a WOW giveaway and a WOW timing too!! hope to win this time….all my fav products!!! on this valentine planning for some baby shopping as it would be totally dedicated to welcome my lil’ baby in may! so i have a new addition in my valentine list from this yr! This is one of the wonderful Giveaway and I hope I will enjoy it while sharing it with all my friends. I do not have any special plans YET! I guess I want to have a really romantic Val-day as usual and hope to enjoy! this is an amazing giveaway and i think everyone will enjoy it a lot!!!! I love my hubby n kiddo the most. They both are my life can’t live without them. Till now I don’t have any special plan gor valentines day but yes off course I’ll make sum plan. Deepika, thanks for the generous giveaway. I usually make no plans for V day. Have a good Sunday. I love myself the most! I believe no one other than me or my family can pamper me on V-day. My plans for every V-day is to go for shopping and then stop by for some delicious macaroons or cupcakes! Really wish to win! Didnot win the blush palette before! I am up for this one!!!! On Valentine’s day, I’ll put a leave to my office by telling some reason & I’ll spend my day with him. I’m going to surprise him by gifting him some Love Birds. It would be a perfect gift for him on this special day, because Love Birds indicate Pure Love. We’ll go to the Beach & enjoy some time over there and after that we’ll have our lunch at a Restaurant. In the evening, we’ll go for a movie. These are my plans for Valentine’s day. I have recently found love(at last!) after a painful breakup of a 5year long abusive relationship. There is no better feeling than to be in a relationship where you’re loved, respected and cherished at every moment of your life and its existence. All I wish to do this V-Day is convey the same message to my partner who made me feel the woman I deserve to be. A home cooked feast, cake(he is ga-ga over the dark chok’lit variant! ), lots of lurvin’ and a short trip to the hill station Mt. Abu maybe(a place that never tires him and he loves). I just wish to tell him that he has given the world to me and deserves nothing short of the very best. i love my love and my mum the most.so we r going to celebrate v day at home.me and my fiance are planning for some experimental cooking.we are going to pamper my mom with lots of gifts coz its her b’day.definitely going to wear something red,may be a red suit or saree. Like every person I’ll be for sure meeting my boyfriend and would celebrate with some chocolates and cakes…. and after that I’ll go to nearby anaathalya to distribute chocolates among the kids, I love them and doing this from 4 years on Valentine’s day. love the giveaway….done with all steps.. I will decorate my house very well and start giving him surprise when he will wake up to night. Will change my look and cook breakfast, dinner and lunch for him and serve in wonderful way. there is a lots cant explain my self….. wish to make wonderful day. I will make reservations at a best restaurant and have a lovely lunch with my love and at night will arrange candle light dinner too. A Romantic Dinner for 2, under the moon light by the sea. The winds moving to and fro. Deep we look into each others eye and I rejoice yes yes I won and Divassence has made it fun ! Thats a lovely giveaway !! I surely want to celebrate my valentines day with my loved ones i.e family /friends (calling up everyone ,meeting and try to make it a fun and a special day 🙂 ) .Also would want to look my best and pamper myself with these lovely stuff . Thanks for the giveaway and stay blessed !! I am hitched from past 8 months and this is our first Valentine’s Day, am very excited. I love my Family so Much….candle light dinner with family. more fun at home. Light candles. Putting a fancy table cloth. Perhaps some soft music. Conspire with the kids by telling them to keep it a secret, which may inspire them to get into the spirit as well!. I love being admired by my family members and friends for my willingness to offer them any kind of help at any moment without looking for an excuse to avoid them 🙂 They count on me with total faith and it love that feeling in my heart. I love my Mother the most and wish to spend the Valentine’s day with her. What i am planning on this valentine day for my hubby is A heart Shaped bouqet of Red Roses Containing a letter describing how much I loves him…With seeing all this ,i hope ,he will really lose all his senses coz he very rarely expresses his love….Wow so excited..hope it may get possible this time only..
It’s awesome giveaway all my favorites. Hi I am Haritha…nd i m crazy abt lipsticks..i jst lv them 🙂 :D.
I love my darling hubby the most after my mom. His caring n positive attitude makes me more strong. He is my life line. I love my hubby the most.. He is my life line. I’ll plan special surprise on this Valentines day for him. hello my name is Ira Sharma..I am a recent lover of lipsticks & blushes..! I will spend my valentine’s day with the love of my life & my partner in crime… 😉 my hubby…!! Fingers crossed for this awesome giveaway…! My boyfriend has never seen me in makeup and I would like to surprise him on Valentine’s Day! i love chocolates and presents.! I will make a beautiful handmade Valentine card for my Rehan.buy gifts..and many more things we hv planned..We will do promise to each other that we love ever and forever wheather the conditions are good or bad..really I am so lucky to have Rehan.he is my life..I will make my valentine day memorable…..
Love all your posts and wish to win 🙂 Want to beautify myself with your giveaway products this valentine. Jessica chan: I love lipstick! this valentiens i’m going snowboarding.